The other night, I saw the end of the 1958 movie Auntie Mame, starring Rosalind Russell as the iconic title character. The film was on TCM and at its end, host Robert Osborne came on and, as he normally does, wraps up the film with an interesting bit of trivia about its stars or the folks who made it. I really enjoy these stories as they usually give you some info that I didn’t know before that often adds a layer of understanding and interest to the film. On this particular occasion, Osborne spoke for a minute about the author, Patrick Dennis, who wrote the book behind the film, Auntie Mame: An Irreverent Escapade in 1955. Although I knew of the stageplay and film as well as the later musical versions, Mame, I knew nothing about the author. Patrick Dennis was an unknown quantity to me. 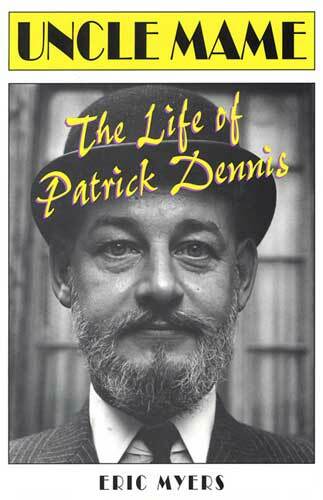 It turns out that his story is a fascinating one that was documented in a book , Uncle Mame: The Life of Patrick Dennis , from author Eric Myers. Patrick Dennis, whose real name was Edward Everett Tanner, was spectacularly famous as an author in the 1950’s, the toast of the NY publishing world. He wrote 16 books, mainly comic novels and almost all bestsellers, which made him many, many millions of dollars. Auntie Mame alone was on the NY Times Bestseller List for 112 weeks. He was married with two children and seemed to be living the American Dream but that was a mere facade. He lived another life as a gay man and also washed away all traces of who he really was with torrents of hard drink. His fame steadily waned in the 1960’s as his books fell from fashion and his boozy, freewheeling lifestyle left him near broke. His life entered a second (or third) act. He reverted to his original name and, knowing well the world of wealth, became a butler. He buttled for the family of McDonald’s founder, Ray Kroc, and a few others who had no idea that the bearded gentleman managing their home was the famous author responsible for Mame. He worked anonymously. After several years, he was diagnosed with pancreatic cancer which ended his life in 1975. He was 55 years old. While the play and film stand well enough on their own, the story of Patrick Dennis is a truly interesting footnote to Auntie Mame.